In many ways Ra God was the personification of numerous human needs recognized by people in early times, among which was the luxury of growing old and retiring from the day-to-day cares of the active world. Like a farmer who has grown too old to spend the entire day in the fields, Ra God tired of the daily routine of rising m the east and setting in the west, always besieged by enemies. He looked forward to turning things over to his children, but like many mortals he was slow to recognize that the time of retirement was approaching, and had to be urged toward it by those around him. Some of the most interesting of his myths are set during this Period of his life. In one story, Ra God complained of fatigue to Nun, the primeval Waters, who set about trying to find him some help with his daily chores. First the sky goddess Nut was instructed to take the form of a cow and carry Ra God through the sky each day (a variation of this story said that Nut gave Ra God the ride to help him escape from the angry human survivors who did not take kindly to Hathor’s destruction of so many of their friends and kin-see Chapter 7 “Hathor”). Anyway, Nut became responsible for carrying Ra God each day, but the strain was too much for her and her limbs began to tremble. Ra God declared that he would find help for her and commanded her father, Shu, to support her belly (this is a variation of the myth that says Shu holds Nut up as the sky to separate her from the earth). When the men of earth saw Ra God upon Nut’s back, they began to regret their neglect of him. The next morning they appeared fully armed and ready to do battle against his enemies. Encouraged by their support, Ra God immediately forgave humanity’s earlier sins, which he attributed to the wiles of the earth’s serpent population. Geb, as earth god, was held responsible for the trouble caused by these malign creatures, and was ordered to take the necessary steps to see that the problems did not occur again. Finally Ra God called Thoth to come with haste into the chief god’s court. Thoth was told, from that moment on, to keep a written record of the punishments Ra God had decided for his enemies. Thoth was also to assume the title of asti, Ra’s deputy, and was to become Ra’s representative on earth. In order to ease Thoth’s task, Ra God created the ibis as Thoth’s messenger among men, gave him the use of the power of the sun and moon, and lastly if this part of the inscription is properly understood-brought into being the ape to assist Thoth in driving back his enemies. Thus did Ra God spread out the responsibilities of his divine office and make his life a little less wearisome. This story was told on the walls of the tomb of Seti I near Luxor that date from the early part of the Nineteenth Dynasty (1320-1200 B.C.). The inscriptions are partly damaged, but most of the myth can be discovered and the rest guessed at. 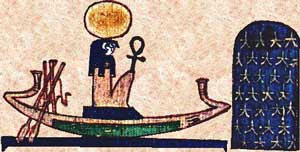 Nearby is a beautiful drawing of Nut as the cow goddess giving Ra God a ride in his solar boats, but the exact connection between the drawing and the story remains the subject of considerable scholarly speculation.